The Gibson SJ-200 True Vintage Acoustic Guitar has a lot to live up to, for the original SJ-200’s were some of the most popular guitars of their time. A good thing, then, that this Gibson TV series model lives up to the Gibson’s reputation for producing great acoustic guitars. The SJ-200 is known as King of the Flattops. Modeled after an early 1950’s acoustic model, the Gibson SJ-200 True Vintage has a premium Sitka spruce top and AAA flame maple back and sides; a combination which, when combined with the True Vintage’s super jumbo body, makes this a guitar with an almost aggressively bright sound; an excellent feature when one is playing solo work and needs to be heard. There are some who would say that the True Vintage is too bright and brings to mind the rather twangy tone of the early country music artists. But with the right strings and the proper application of finger pressure, the True Vintage actually produces a rather punchy tone; albeit at a volume that takes most players by surprise. 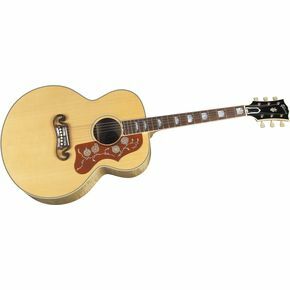 At ~$5,0000 the Gibson SJ-200 True Vintage is by no means a cheap acoustic guitar, but is well worth the money as it can definitely bring out the best in any player. This, like ANY Gibby or indeed any guitar of any make which retails at this price, SHOULD be as good as the reviews say. When one shells out heavy coin like this, quality of commodity should not be in question. So all I can add to 'Guitar Guru's' review is: "I should %=&#¤ think so, too!"